His instructions start from a brand new RPI Model 2 with a blank SD card and get you to a running installation. I’ve followed the procedure 3 times now and it has worked w/o problem. Before going any further, I should mention this to any Lazarus / Free Pascal newcomer: if you have never used Lazarus before and just want to play with it, don’t follow these procedures. They are long and complicated. Instead, just install the old version of the compiler using these instructions. The old version of the compiler is very stable and most likely has all the features a newcomer will want. If you want to seriously write Pascal code for the RPI, THEN these instructions are worth the extra trouble! I’m going to summarize the steps as I did them. I also start with the assumption you already have a running RPI. I am using a Model 2 B with a USB HDD (you won’t need one, but it make everything run snappier). My instructions have been modified to produce a compiler that will produce ARMV6 code which will allow your programs to run on both Model 1 and 2. If you are going to only use your code on model 2’s, change the OPT on all of the make commands to remove the -CpARMV6 and -OpARMV6 switches. These are terse instructions and assume you know what you are doing. If you’ve not done this before, I suggest you use the original site. Once you are familar with the procedure, these instructions are easy to copy/paste straight into a terminal window. It is best to use SSH, not VNC to access the RPI as you want to reduce memory /CPU consumption as much as possible. For the same reason, make sure Firefox is NOT running. I make sure the O/S is up to date and the Raspbian supplied version of Lazarus / Free Pascal has been removed. The default swap file size is 256MB. It appears that trying to recompile the Free Pascal compiler will not work unless you increase the swapsize to 1GB. Once you have built the compiler, you can go back to a swap file of 256MB. On my RPI, you can see that root has 87G available. I have plenty of room to increase the swap file size AND recompile the compiler. Sep 2017 Note: The bootstrap compiler is found at https://sourceforge.net/projects/freepascal/files/Linux HOWEVER, not every version has been including the linux-arm release. For example, at time of writing, it exists for 2.6.3 and 3.0.2, but not 3.0.0. This can limit the versions of FPC you can compile. From what I can tell, you need the prior version to compile the version in question. In other words, if you want to compile 3.0.2, you need 3.0.0 BUT it isn’t available. You will want the fpc-3.0.2.arm-linux-eabihf-raspberry.tar compiler. You are ready to install the compiler. You MUST ANSWER /usr/local to the first question! To all other questions, just press enter to accept the default. ./install.sh                #ANSWER 1st Q with /usr/local!!!! Rest are default. These instructions are going to install the most recent version of Free Pascal which is found at http://svn.freepascal.org/svn/fpc/trunk. That probably isn’t the best idea. The trunk version is test code and can contain bugs. This bit me hard when following the instructions for an Orange Pi – the compile failed and I wasted hours blaming it on the OPI only to find it was issues with the source. I fell back to the most recent release (3.0.4) and that worked just fine. If you want to install an older version, take a look at http://svn.freepascal.org/svn/fpc/branches to decide the version. Now you need to determine the installed version of FPC and create a sym link to that version. I’m going to be using 3.0.1. The 2.6.4 version is the seed compiler. I suspect it would not be a good idea to use it as your production compiler. As with FPC, this will download the latest version. 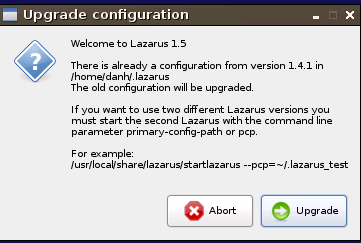 You can find old versions at http://svn.freepascal.org/svn/lazarus/tags. If you choose to use one, update the svn command below. As set up so far, the compiler will run, but linking will return a warning indicating crtbegin.o and crtend.o could not be found. The program still links OK, but I don’t like warnings like this. This library needs to be added to the /etc/fpc.cfg file. You are ready to run Lazarus. First, exit so you are no longer root. Use whoami to verify you are back on your normal user (pi maybe?). I’m assuming if you are trying to do all of this yourself, you understand Lazarus runs in XWindows and you will need to be running XWindows either directly via the HDMI connection or by using tightVNC to access the RPI. If none of this makes sense, see the source article. It will explain this much better. 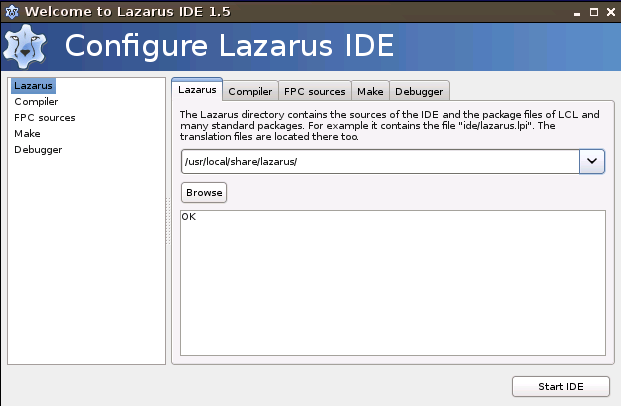 To start lazarus, click on <menu> | Programming | Lazarus. I use the following settings for each tab. If the setting is correct, you should see ‘OK’ in the 2nd window. Lastly, if you changed the swap file size, go back and set it back to the original size and reboot the RPI. 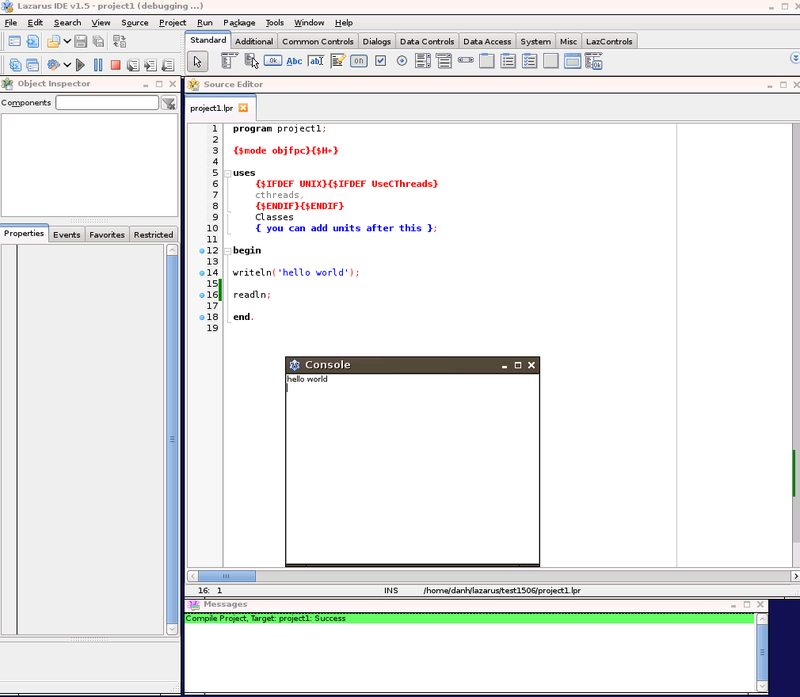 This entry was posted in c-lazarus, c-rpi and tagged Compile RPI Lazarus. Bookmark the permalink. I have RPI1B+ and PFC2.6.4, Lazarus1.2.4 on it. Can i use this PFC2.6.4 as seed compiler for compiling trunk version 3.1.1? I’m going to say probably, but I can only say for a fact that the procedure I outlined works. The procedure uses FPC 2.6.4, but it uses a version the compiler located on sourceforge. This procedure is complex enough, chances are something is going to need to be tweaked to get it to work for you. I would just install the seed compiler from source forge and delete it after you are done. Then you don’t have to try to figure out why something fails, if it does. Check out the tweaking4all link at the very top of my post. There are quite a few people playing with the latest/greatest stuff there and they can provide more help.